Pitcher plant trap trichomes, coloured scanning electron micrograph (SEM). Nepenthes pitcher plants are tropical carnivorous plants. Scent, nectar and colour attract insects that fall into the liquid at the bottom of the pitcher. Trapped there, they are dissolved by digestive enzymes. This provides the plant with nutrients, such as phosphorous and nitrogen. Pitcher plants are found in nutrient-poor habitats, such as swamps. 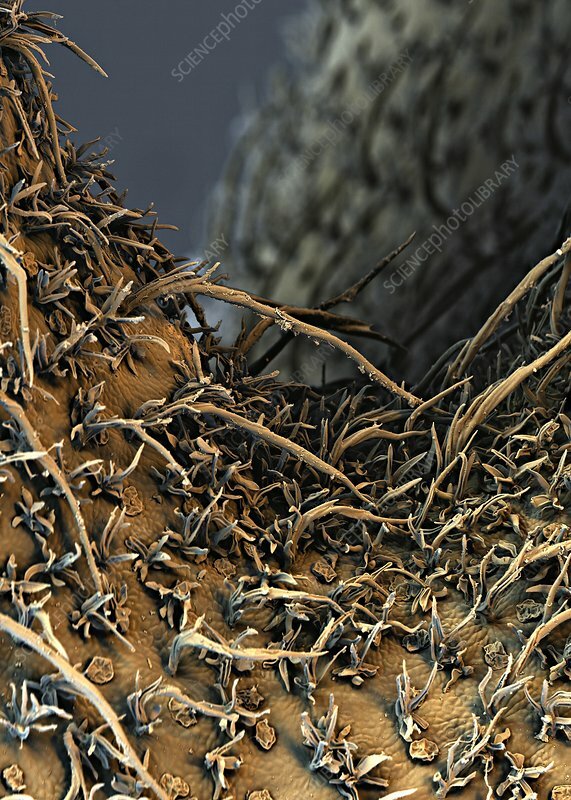 Trichomes are specialised structures that may perform several functions, from glandular secretions to preventing water loss, to trapping insects.